Soft touch lamination also calls velvet lamination or Cello touch. It is a kind of film laminated which feels a matte and a soft texture. It is velvet touching feel. After doing soft touch lamination, the product looks luxury and high end. Because of the premium feel, soft touch lamination is used on luxury products cover or high end packaging. 1, It is good for high end products. 2, It can protect surface. 2, The surface is easy to scratch to compare with gloss lamination and matte lamination. That means, the soft touch lamination is soft. 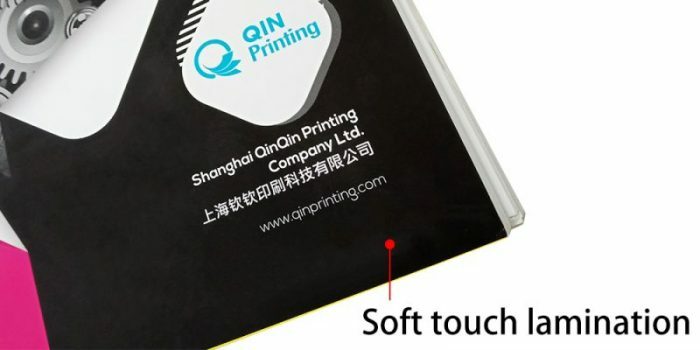 If there is any scratch on the producing process, surface is easy to be scratched and it is easy to get finger imprinting. If you need any soft touch lamination sample or soft touch lamination request, please contact our sales experts. We provide free soft touch lamination sample for choice.